What's next, hieroglyphics? All the cool kids are using animated emoticons, or space numbers, or some other thing you aren't cool enough to understand. 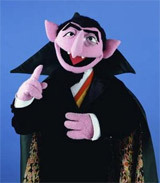 Remember The Count from Sesame Street? That guy was scary. Anyone that old who laughs like a maniac every time he counts to 3 just isn't right in the head. For too long, the 10-digit system has enslaved us. Some intrepid programmers tried to fight it in the 70s with binary, but they were punished for their hubris by being locked away in cubicles and forbidden from having girlfriends. Remember the SAT, ACT, GRE, MCAT, LSAT, etc., and how that one number determined your entire future? How messed up was that? What sadist thought that staring at your weight would be a great way to start the day? If I was in charge, we would all have magic mirrors like in Snow White that said things like "Hey, big guy, lookin' good!" Seriously, have you watched the History Channel? Who wants to write Copyright ©1988 at the end of a movie when they can put "MCMLXXXVIII"? The stock market is plummeting, your home is worthless, and you lost the Lotto (again). What do these things have in common? Numbers. That's right - numbers are to blame for pretty much every problem you have right now.